In Rachel Zucker’s re-imagining of this Greek myth, Persephone is a daughter struggling to become a woman. Unlike the classical portrait of a maiden kidnapped by a tyrant, Zucker’s Persephone chooses to travel to the Underworld and assume her role as Hades’ queen. Caught between worlds-light and dark, innocence and power, a mother’s protection and a lover’s appeal-Persephone describes the strangeness of the Underworld and the problems of transformation and transgression. 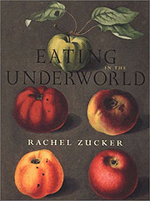 The arrangement of Zucker’s poems reflects Persephone’s travels between the Underworld and the Surface. Both spare and lyrical, they are written as entries in Persephone’s diary and as letters between Persephone, Demeter, and Hades. The language-strange, urgent, direct-is pulled and changed as Persephone journeys from one world to another revealing the struggle of unmaking and remaking the self.